Increasingly, companies are realising that different HR policies need to be designed to attract and incentivise different age groups, and the youth in particular. The average age of managers at JK Tyre's Chennai plant is 23. The engineers are also just as young. It was a deliberate decision of the management to appoint a large number of young people in key positions at this plant. Managers and engineers were selected, one of every eight applicants, six months before the plant started in February 2012. "It was done to give young people in our company a sense of empowerment and make them feel they belong," says Vijay Deshpande, Vice President and Head of HR, JK Tyre & Industries. "They get a leadership profile at a young age, learn to take instant decisions and feel in charge." To prepare them for their task, the chosen young people were also given behavioural training on how to deal with other age groups, as well as on-the-job training at other JK Tyre plants. Yet another policy across the entire company, called "Krishna-Arjuna" has every promising young person pairing with a senior colleague, who mentors him/her, preparing the young person for middle- and senior-level responsibilities. A third policy is that of regularly sending young performers to Germany to visit vendors who supply some of JK Tyre's machinery. Notably, senior employees, who are usually less enthusiastic about travelling, get cash rewards instead for doing well. JK Tyre is not the only one. Increasingly, companies are realising that different HR policies need to be designed to attract and incentivise different age groups, and the youth in particular. Fast-moving consumer goods major Dabur India, for instance, no longer insists as it did before, that if two fellow employees get married, one of them must quit the organisation. "Now they can continue working at Dabur as long as they report to different bosses," says V. Krishnan, Executive Vice President-HR, Dabur India. The company also provides young employees not only maternity but also paternity leave. Again, for its frontline sales force, most of whom are young and usually travel a good deal on two-wheelers, it provides higher insurance cover than for others. What about older employees? Senior managers get club memberships which junior ones do not. 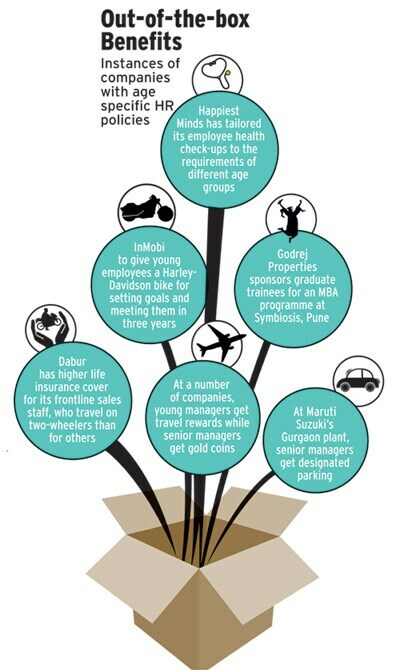 At mobile ad company InMobi, employees - most of whom are young - are allowed to set their own goals and work towards them, sticking to a timeline which, too, they lay down for themselves. They know that in three years since they joined, or by December 2016, whichever is later, the company will reward them a Harley-Davidson bike. At clothing and accessories company Bestseller Retail's India unit, entry-level employees get daily cash incentives for meeting their targets. Mid- and senior-level managers do not - they get the usual variable pay component in full once a year for performing well. "Young people will not wait a whole year to be rewarded," says Ashish Kumar, Chief People Officer at Bestseller Retail. "We worked out this initiative after looking at their needs. For some, the total incentive earned per month works out higher than their salaries." Rajesh Shetty, Senior Consultant, Acumen Business Consulting, agrees. "At many companies, if young managers serve three years, they get travel rewards while in some other companies, senior managers fulfilling certain goals get gold coins as reward," he says. Some companies also offer young employees a "dating allowance" for doing well, while older ones exceeding expectations get consumer durables or holiday packages. Where health is concerned, however, the scenario is reversed - it is the seniors whose health more often lets them down and thus need to take greater care. So L'Oreal India has health insurance schemes for senior managers, which allow them unlimited medical reimbursement. Other companies, too, have generous health policies for the older lot. "All members of my family are covered under my company's Mediclaim policy. I personally have an insurance cover of Rs 5 lakh paid for by the company, and I am also allowed to increase the upper limit by paying a subsidised premium," says Amitabh Prasad, 41, General Manager, Marketing, JK Tyre. Some companies are working on making the mandatory health check-up for employees different for different age groups - thus, it may be just a few blood tests for young people, but older ones have to undergo a full body scan. "We have tailored our health check-ups according to the requirements of the employee," says Raja Shanmugam, Co-founder, President and Chief People Officer, at tech company Happiest Minds. Companies varying their HR policies according to employee age, however, have to ensure no charges of favouritism are hurled. Thus such policies are rarely cast in stone or even put down in writing. "Most companies do not want to be seen as discriminatory by defining a policy that obviously benefits one particular age group, be it young millennials or mid-level management or senior leaders," says Udit Mittal, Managing Director of executive search agency Unison International. However, different age groups do have different priorities and companies have begun to recognise this. Employees above 40 look for financial security and work-life balance - employee stock options, easy home loans, flexi-hours, etc - while the young want more take-home pay and immediate cash benefits. "We have been experimenting with a bouquet of human resource policies for the past 10 years," S.Y. Siddiqui, Maruti Suzuki's Chief Mentor, had noted at Business Today's Knowledge Forum earlier this year. "For youngsters, compensation must have a cash element, while for the older generation it's the benefits that matter." Many companies now attach increasing importance to training programmes as well, particularly for young employees. "We have a tie-up with Symbiosis Institute of Business Management, Pune, for general MBA programmes for the graduate trainees we hire," says Milind Apte, Executive Vice President, HR, Godrej Properties. "The entire cost is borne by the company. We do charge such employees a negligible amount but that, too, is reimbursed if they stay with us for more than two years. We also have a tie-up with IIT Bombay for trainees with a technical background." Many other companies have similar arrangements with different institutes, while some, like JK Tyre, have different training programmes for different age groups. Others have programmes in-house. Mahindra & Mahindra, for instance, has a talent management process, started in 2004, consisting of a network of business and functional councils that address questions of skill and competency creation and succession planning for strategic business units. 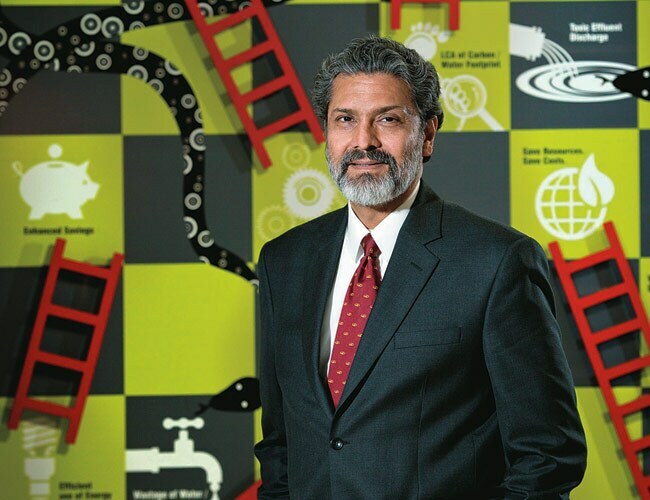 "There is also an Apex Talent Council, chaired by Group Chairman and MD Anand Mahindra himself, which collates the work of these councils and focuses on talent rotation across businesses, locations and functions," adds Rajeev Dubey, President (Group HR, Corporate Services & After-Market), at M&M. Just as JK Tyre has its Krishna-Arjuna project, M&M has 'Fireside Chat', in which a senior leader candidly shares his professional experiences with 18 to 20 mid-level managers. The Godrej Group has a 'Godrej Fellows' programme to create future leaders - every year, it selects a dozen exceptional employees across companies and functions as 'Godrej Fellows' giving them challenging tasks. Overall, the task of the HR manager has just grown more complex. "Earlier, it used to be only about hiring and talent retention," says Subeer Bakshi, Director, Talent and Rewards at professional services company, Towers Watson. "Now the task is to identify the generational groups in the company and design specific policies. One-size-fits-all policies are nearly redundant."